So cute.....love your color choice! Thank you for sharing! That's a cute and lovely card :) I love the snowflakes die! That snowman is so cute, great card! What a cute card! I love the pop of the pink scarf! Loving how adorable this little snowman is! Thank you for sharing! your scalloped border dies are perfect for this. Love the creative use in your layering. Thank you Kari! I just love that snowflake window die... so intricate! Congrats on guest designing! Your card is so sweet, I really love that snowflake die! 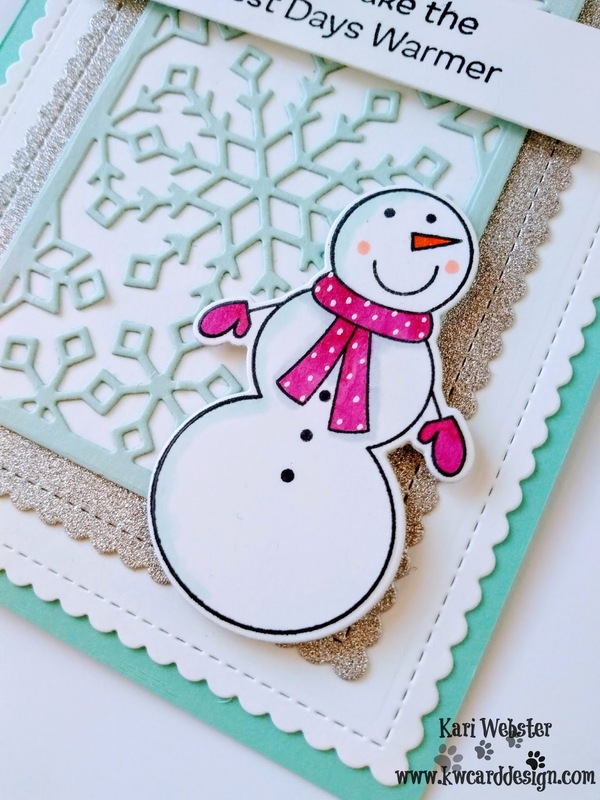 Love the cute snowman and the snowflake die cut. Super cute card! Love that background die especially! I love all of the layers you have on this card. so pretty. Beautiful card bringing lots of warmth. The more I see the snowflake window,the more I like it! I love that snowflake die. And snowmen are my weakness. Super cute card! I just love the snowflake window dienamics. Super fun and so adorbs. TFS. Love how you framed out this card, the layers are perfect! The window die makes such a delicate and lovely addition to a card. The window snowflake is so pretty. The like the colors you chose. CONGRATULATIONS on being a guest designer for MFT, One of my favourite companies, but being in the UK in find it hard to get their products. Beautiful layering. Such a happy holiday card. I love how you showcased the new products! Very cute card,love the layering. Super sweet card! I love how you jazzed up the snowman's scarf for a little extra interest. 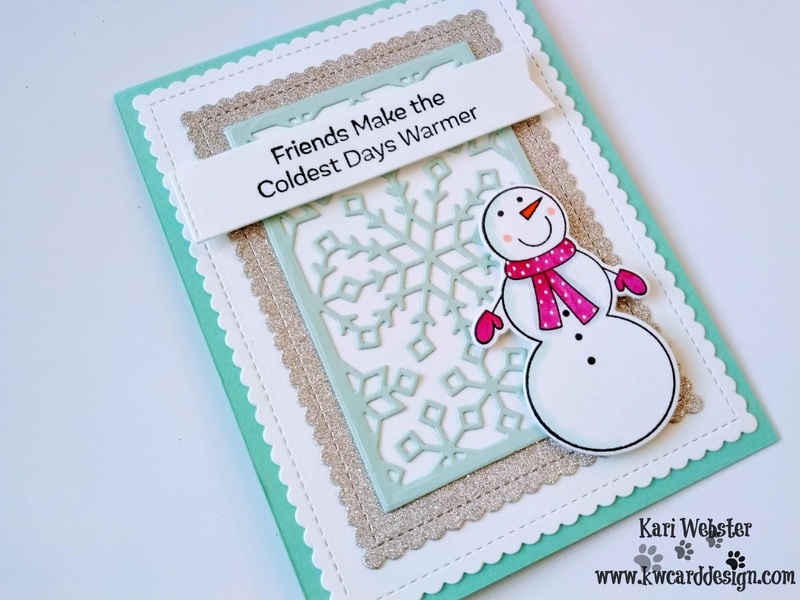 The snowflake window die is so pretty and ties everything together on your card. Congratulations on being a guest designer for MFT! That really is a crafting achievement unlocked. Your card is lovely. The layers of die cuts are such a nice way to enhance the adorable snowman. Thanks for sharing! Love the design, the colours and the use of glitter, really nice card! Congratulations on joining mft as a guest designer! 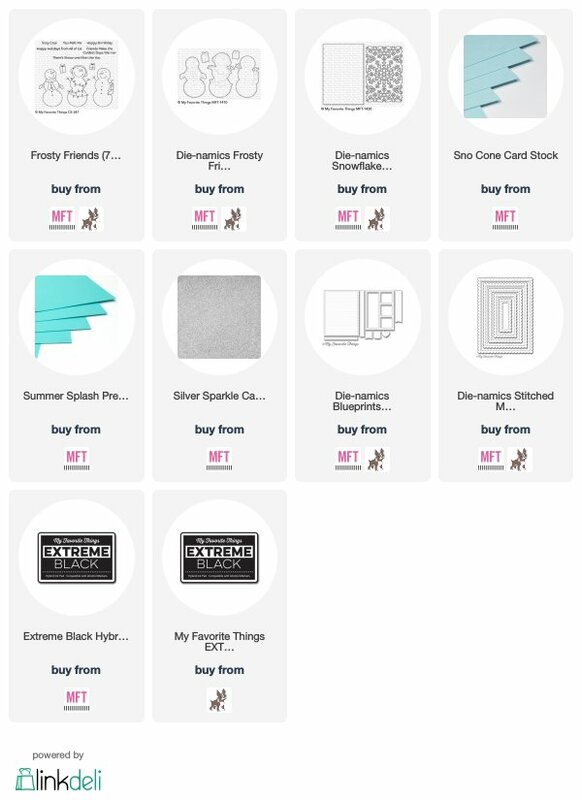 Your card is really cute and I love all the different layers with the new products they released. Lovely layers and such a cute sentiment! Great card!! Love ❤️ the layers! Absolutely adorable! love cute snow man and color combo! Thanks for the inspiration Kari! So cute! Love the color combo (turquoise is my favorite color!). Beautiful card, the snowman is lovely! So sweet!! Love the softer colors! Love your card! The snowflake cover die is awesome with the snowman! Cute card, love the mint/pink combo. 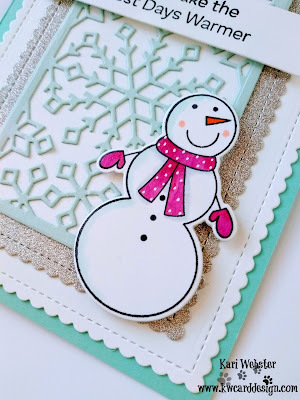 I'm loving all the layers on this adorable snowman card! What an adorable card! I like the scalloped edges in your layers! Such a cute snowman! I love the layers and colors! Wonderful job! Wonderfully sweet and adorable card! Love the layers and glitter paper. Love the combination of the snowflake window and the simple adorable snowman. The color scheme is also stunning. Lovely layers - great use of the snowflake window die and pretty color palette! Such a sweet card! Love the design and the colours! lots of fun in this card and release! fun to see you here! luv the look of the snowflake window. great card!! Very cute with the snowflake die background and the snowman.